The Capital Trails Coalition has developed a set of criteria for high quality trails as it advocates for a world-class trail network in the Washington region. Image by the author. Trails are a huge part of ensuring that walking and riding a bike are among a person's transportation options. But when it comes to building them across our region's many jurisdictions, whether or not they’re safe and inviting can really vary. One group is working on a way to change that. In some jurisdictions, a “trail” is defined as an off-road pathway through an open space. In others, sidewalks and on-street bike lanes can fall under the umbrella of “trails.” When the understanding of what a trail is varies, it's hard to create a true regional network that people of all abilities are comfortable using. That network would not only let people know where to find great trails, but also would lead to low-stress access to open space and healthy, reliable transportation for everyone. The Capital Trails Coalition, a recently formed group to build support for trails, wants to create this network. As part of the effort, the organization developed a set of criteria to determine what factors make a trail good. Arlington's Four Mile Run Trail is separated from car traffic. Image by the author. People feel more comfortable walking and bicycling, and are more likely to do so, when there is separation from motor vehicle traffic. The proposed regional network should be composed of trails separated from cars. Trail width varies considerably across the region, and each trail’s width is influenced by factors like cost, expectations for how often people will use it, and stormwater management. But at the end of the day, trails that are at least 10 feet wide provide enough space to allow people walking or bicycling to pass each other, as well as travel safely side-by-side. The Georgetown Branch Trail is a crushed stone surface. Image by Eric Brenner used with permission. Trail surfaces range from dirt paths to paved surfaces that emulate roadways. For building a trail network in a region that has a lot of urban and suburban places, paved trails or trails with hard-crushed stone surfaces are ideal. While these surfaces are not natural and may not be preferable for hiking or mountain biking, they provide accessibility to people of all abilities. For instance, people pushing strollers and people bicycling can use hard surface trails with equal ease. The strength of a regional network is in its ability to provide access and connections to a wide variety of destinations. To achieve this, each trail in the network needs to connect to another multi-use trail or destination. The Potomac Yard Trail in Alexandria is a commuter route that also provides opportunities to exercise. Image by Fred Shaffer used with permission. 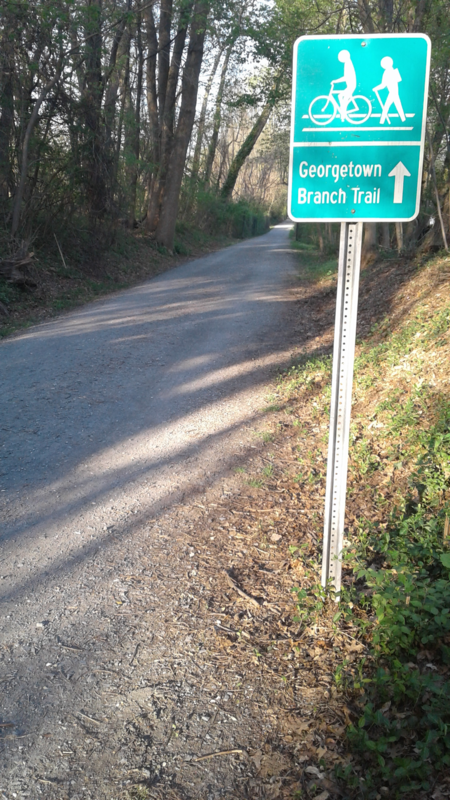 A high-quality trail should serve both purposes, connecting destinations for commuting or running errands, and also include recreation facilities such as benches, wayfinding and informational signs, or even exercise equipment. Often, when planning a trail network, the idea of connecting destinations can overtake practical considerations like how to work around private property, cross over wide rivers or freeways, and climb steep hills. For a trail to be part of the region’s network, it needs to be feasible. This means not only has the trail been identified by the local jurisdiction, but it also can be constructed within the coming 25 years. Design standards refer to the detailed engineering elements of a trail. This includes how steep a trail is going up or downhill, how wide the turns are, and what happens at intersections between trails and streets. Trail design is constantly evolving, so for new trails to be considered part of the network they should at least meet the current best practices. For now, this would mean meeting Americans with Disabilities Act (ADA) guidelines as well as standards outlined by recognized organizations such as AASHTO or NACTO. High quality trails are increasingly important for advancing safe multimodal transportation as well as physical activity. Consistent criteria for high quality trails can show local jurisdictions the necessary elements to make trails comfortable for everyone. A network of high quality trails will help transform public life by providing healthy, low-stress access to open space and reliable transportation for people of all ages and abilities. The Coalition plans to use the criteria to map out a regional network and then engage with local agencies and the public to make the trail network a reality. The criteria are a work-in-progress, but they all emphasize elements that would encourage region-wide walking and bicycling. Are there other elements that should be included? Please visit www.CapitalTrailsCoalition.org to learn more about the coalition, its work, future events, and how to get involved.